My name is Amir. I am 11 year and 8 months old. In August 2014 I joined CRLC and wrote this story. "I write about the past when I had good days with my friends at school. I miss those days. Maybe it was written in our fate that we had to flee and come to Indonesia. I don’t know what should I call these days. I lost all my friends." 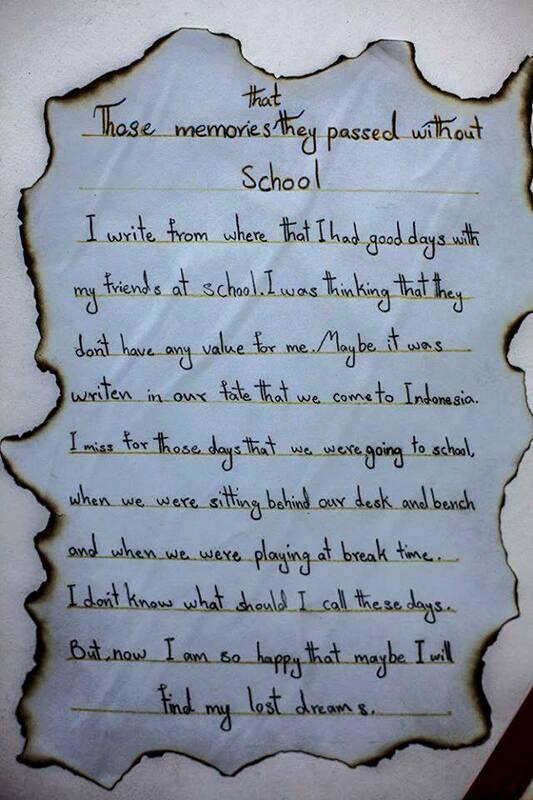 "When we were forced to come to Indonesia I had nothing to do. After two months, I could find an English class. It was good but it was just a language course. I went to searched for school. Even I went to Indonesian school but, I couldn’t continue because I did not understand . One day, someone informed me that refugees has opened a school somewhere for refugee kids. On that time I was so happy and I said “Thanks God”. "I am a kid like other kids in the world. I want a world without any war and clash. I wish those people who fight and bleed should listen to our voice just for one time. They should know that we don’t want war we want peace and education. Going to school is our right. I know that my school has limited facilities, but this is a big blessing from God. I want success and healthy life for all of my school mates. Everyone can be successful in good situations but a strong person is the one who succeed in difficult time with limited resources."